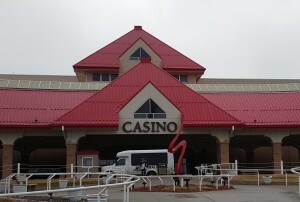 Prairie Meadows Casino in Altoona. Bills pending in the Iowa House and Senate that would let the state’s casinos take bets on professional and college sports would also boost the prize money for the owners of horses that race at the track in Altoona. Troy Skinner, a lobbyist for Prairie Meadows, said 65 percent of the prize money awarded at the track goes to horse owners who do not live in Iowa. Kellie Paschke, another lobbyist for Prairie Meadows, told lawmakers the Altoona casino is contributing $20 million dollars to the horse track now — and it isn’t profitable. Jon Murphy, a lobbyist for the Iowa Greyhound Association, asked senators to consider using sports betting profits to boost prize money for races at the greyhound track in Dubuque as well. “In the spirit of ‘it’s not over ’til it’s over,’ we would like to continue that conversation…until the buzzer has sounded, so to speak,” Murphy said. Senator Pam Jochum, a Democrat from Dubuque, doesn’t support increasing the size of the prizes or “purses” paid to winning racers at the two tracks. Senator Roby Smith of Davenport is the Republican who’s guiding the bill through the legislative process and he’s presided over six public hearings on the evolving proposal. The next stop for the sports betting bill in the Senate is the ways and means committee. Similar legislation has cleared two committees in the Iowa House.